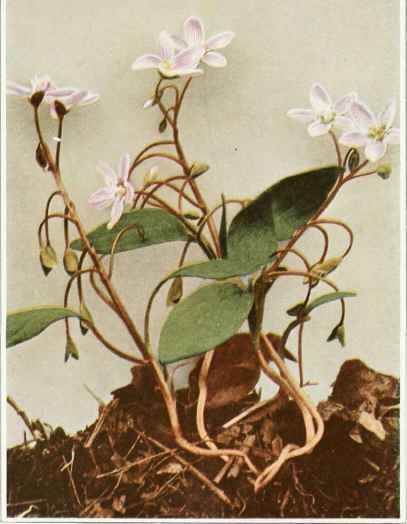 Closely resembling the Narrow-leaved Spring Beauty, but usually more erect. Basal leaves ovate-lanceolate or oblong, 1 to 4 inches long, one-half to 1 inch wide, obtuse; stem leaves petioled; flowers fewer. The corm is usually thicker and depressed at the top. In damp woods, Nova Scotia to Saskatchewan, Connecticut, south to North Carolina along the mountains, and to Ohio and Missouri. Rare or absent near the coast in New York, but very abundant in the interior where it occurs in almost every moist woodland. Flowering in the early spring.